A move in direct contact with an enemy stone and in (just) diagonal friendly contact. A stretch in diagonal contact with an enemy stone and in direct contact with a friendly stone. It strengthens the friendly stone by adding two liberties, and gives it direction. While it does not directly take away a liberty of the enemy stone, it obstructs a direction of development. A move in second direct contact with an enemy stone on the other side of the enemy stone. By reducing the number of liberties to two, it puts pressure on the hostile stone to choose direction. This is often a bad way to attack, see four basic shapes under the ripped tobi section for more details. A move in direct contact with a friendly stone is that touches an enemy stone on the other side of the friendly stone. By adding two liberties it strengthens the friendly stone. Though both push and bump combine a nobi from the friendly stone and a tsuke on the hostile stone, they are not called nobi-tsuke. A move in direct contact with both an enemy stone and a friendly stone on different lines. response to a kata-tsuki. See also: Never ignore a shoulder hit. A move in direct contact with both an enemy stone and a friendly stone on the same line. Black bumps into the white stone. Another move in direct contact with an enemy stone and in (just) diagonal friendly contact. This time the hostile stone is at keima. 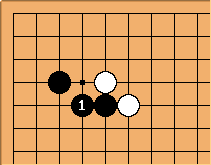 This combination of kosumi and tsuke in one move is called kosumi-tsuke. Neither are they called tsuke-nobi, the term tsuke-nobi is used for a sequence of tsuke, hane and nobi. Both hane and kosumi-tsuke combine a kosumi (friendly) and a tsuke (hostile), but the hane is not called kosumi-tsuke. Language is as language does. See also Japlish.